To maximize yield potential, it’s more important than ever for growers to know what’s in the seed treatments that protect their seeds. 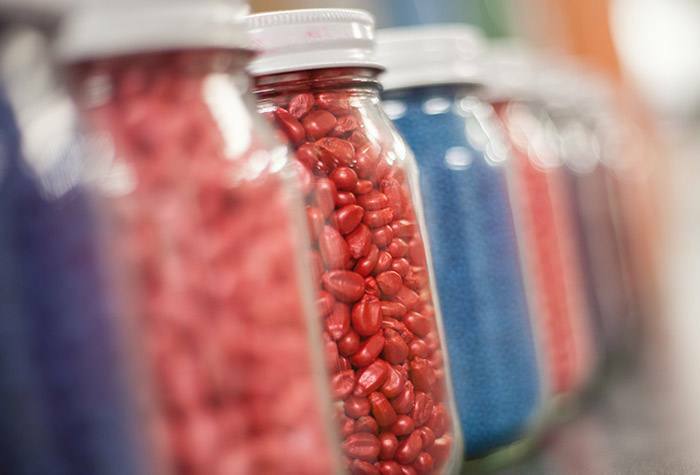 Jars of treated seeds are on display at the Syngenta Seedcare Institute in Stanton, Minnesota. When it’s time to buy a pickup truck, do you just buy the first thing the dealer shows you? Unlikely. When it’s time to take it easy, do you just grab the first beverage you see? Doubtful. Experts at @SyngentaUS say it’s more important than ever for growers to know what’s in their seed treatments. Steve Gomme, product lead for Seedcare at Syngenta, agrees and adds that as demand for seed treatments continues to rise, growers need to know what they’re really buying. 1. What active ingredient or ingredients are included? Some seed treatments may only contain one active ingredient, while others contain multiple active ingredients with more than one mode of action for broader protection and improved stewardship to address resistance issues. 2. What does the seed treatment protect against? While seed treatments can include fungicides and insecticides, there’s more to producing top yields than just managing disease and insects. For example, soybean cyst nematode (SCN) remains the No. 1 yield robber in soybeans. “It’s essential to ask whether your soybean seed treatments also protect against nematodes,” Gomme says. 3. Who stands behind the seed treatment? It takes significant investments of time, money and expertise to develop proven, reliable seed treatments. “Also, make sure the company that supplies the technology provides service and support before, during and after the sale,” Ireland says. Vibrance® Trio fungicide seed treatment—Developed primarily for soybeans, Vibrance Trio helps growers control early-season disease and boost root health for optimal water and nutrient uptake. Vibrance Trio, which received EPA registration this summer, is available for the 2019 planting season, with registration on pulse crops and legumes anticipated as well. Independent trials prove Vibrance Cinco, which is available for the 2019 planting season, consistently outyields commercial standards by 2 bu/A, says Edgington.2 He adds that, in trials with heavier disease pressure, the seed treatment produced a 6.7-bu/A yield benefit.3 This yield advantage results from the powerful disease protection Vibrance Cinco offers, which leads to maximum root development, emergence and stand establishment. Vayantis® fungicide seed treatment—Pending registration from the Environmental Protection Agency, this new, systemic fungicide seed treatment with a brand-new mode of action will protect corn and soybean seedlings from key diseases caused by oomycete plant pathogens. In corn, it is expected to offer the broadest spectrum of protection against Pythium, the No. 1 most destructive disease in the crop, across more species of the disease than any other product. Picarbutrazox belongs to the tetrazolyloximes chemical group of fungicides (FRAC code U17). This seed treatment has no known cross-resistance and will broaden integrated-pest-management strategies, says Ireland, who adds that Syngenta anticipates registration in early 2020. Saltro® fungicide seed treatment—Also pending regulatory approval, a new fungicide seed treatment will help protect soybeans against sudden death syndrome (SDS) and nematodes, including SCN. It contains Adepidyn® fungicide and will be marketed as Saltro seed treatment. In trials with high-pressure SDS disease situations, Adepidyn has delivered a 3-bu/A or more soybean yield advantage, compared with ILeVO® seed treatment, Ireland notes.4 “Even in trials with low-disease-pressure situations, we still see a 1.5- to 2-bushel yield bump5,” he adds. Adepidyn protects against SDS without causing additional early-season plant stresses, like phytotoxicity and stunting. Adepidyn is a novel fungicide molecule from Syngenta with the succinate dehydrogenase inhibitor mode of action. “It’s easy on early plant growth and provides a new level of protection from Fusarium, which causes SDS,” Ireland adds. Syngenta anticipates first registrations of Saltro in the U.S. and Canada in 2019, followed by Australia in 2020. This state-of-the-art facility drives value for customers by focusing on products, application and service.